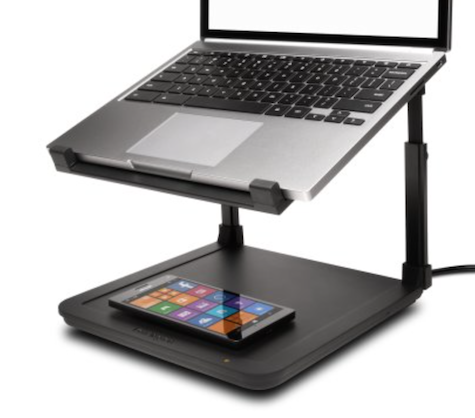 This laptop stand is easy to assemble and securely accommodates a MacBook Pro weighing just under seven pounds. The height can be set at four different elevations to bring your laptop to eye level. 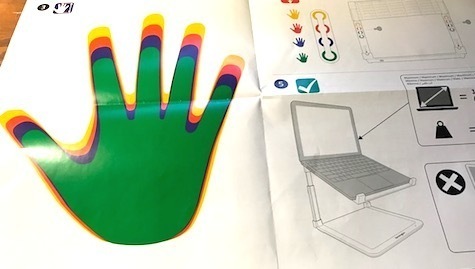 Interestingly, you decide the appropriate height using Kensington’s color coded hand chart. Press your hand against the chart to see how to adjust the stand. The colors correspond to four colored holes on the legs that hold the stand erect. Insert the legs and screw into place. Then take the wide screws and insert into the colored hole that corresponds to your hand size and hand tighten. This appeared to place the stand at the right level for me. High quality graphic instructions are provided. The bottom of the stand’s platform has a plastic maze that can be used to keep your cables tucked neatly out of sight. Just press the cables into the tracks and wind them side to side. The stand works particularly well if you’re using a Bluetooth keyboard. I found the color chart put the laptop at eye level, which is what it’s intended to do, but that did not make for comfortable typing on the laptop’s keyboard. Using my BT keyboard solved that. 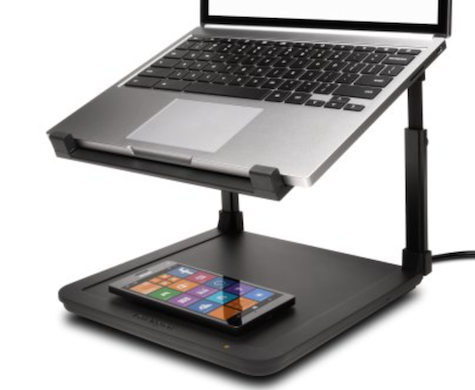 The stand will accommodate a dock, sold separately. The docking station will also make the base a Qi Wireless iPhone charger if your device is Qi enabled. These elements were not included in the product I reviewed. We will update this article after we have an opportunity to test it using Qi-compatible equipment and Kensington’s mounting dock.